Paper Wall is a great piece of binary ice designed to force the Runner to dig for his Fracters. 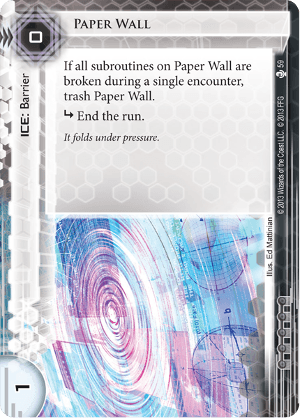 Designed along the same lines as Quandary, Paper Wall's greatest strength comes from how - if this is the only Barrier you're packing in your deck (and it should be, if you're playing this) - you have effectively just forced the Runner to spend time and money installing a breaker that is now completely and utterly redundant. Now, you might say that Ice Wall is significantly better. After all, for just 1c more, you get a permanent Barrier that at least taxes the Runner a little whenever they run through the server. You would of course be absolutely right. If you're Weyland and you're looking to play binary ice, go ahead: play Ice Wall. But if you're short on influence and you're looking for something to fill a Barrier-shaped hole in your defences, Paper Wall can be a very good friend indeed. This card does two things: it ends the run and it costs nothing to rez. Based on mostly gumption, with no real evidence, I'd guess that the life expectancy of this card is about 1 turn after being rezzed. By that count, it's got a shorter shelf life than Chimera if you have 4 credits free. Only play this card if you expect to be extremely poor and only want 1 turn of protection. If you expect AI breakers, Wraparound blows this card out of the water. Even if they drop a fracter, Wraparound will survive to stymie Inside Jobs and the like while this card is crying in your archives. And I'm pretty sure this card won't stick around long enough to feed a Peak Efficiency. On the other hand, this might be slightly useful with Mother Goddess? The runner has to choose between breaking this and Mother Goddess until you rez another piece of ice, so that's like protection. While a very weak card against most decks, it can defend against early game runs at no cost. It also has zero influence, so it can help your early game in any deck. Combine it with an Inazuma in front for a great laugh. Just don't ever use one against Quetzal.